This procedure outlines the Family Group Conference Service in Lincolnshire and aims to provide an operational overview of the Service in Lincolnshire. A Family Group Conference (FGC) is a decision making meeting in which a child's wider family network come together to make a plan about the future arrangements for the child. The plan will ensure that the child is safe and his/her wellbeing is promoted. Family Group Conferences are intended as a respectful and empowering process in which parents, children and members of the wider family or friends are given clear information about the concerns and are asked to work with the Family Group Conference Practitioner to produce a plan that addresses those concerns and answers specific queries. The expectation is that the referrer will attend the FGC to outline the strengths/concerns and then leave the meeting to enable the family to produce a plan that will safeguard against the concerns. Every family is unique and has its own community values, culture, personalities, dynamics and history. An FGC uses the family’s / friends own skills, strengths and personal knowledge to resolve difficulties. Using the family's own expertise and ensuring their involvement in the FGC process can help to support the difficulties that are being experienced by the child/young person at that time. An FGC plan will be created within an anticipated timescale of 6 to 8 weeks. The ethos of Family Group Conference is primarily consensual; however where the child is subject to, or on the periphery of, Social Care involvement, the FGC will be an expected requirement of the child's Social Care Plan. The FGC primarily operates within Lincolnshire Children's Services and a partnership arrangement is being embedded within Lincolnshire Adult Service. This involves the FGC Practitioners working at times across both service areas. Children open to a Team Around the Child) (TAC), where there is an identified acute risk / concern (agreed in advance with Principal FGC Coordinator or Practice Supervisor). Referrals will only be received from Lincolnshire Children's Services staff. Where the child is the subject of a TAC and the Lead Professional is not a member of Lincolnshire County Council, a referral can be progressed via a Lincolnshire Early Help Team with an accompanying Early Help Assessment. Emergency referrals can be made directly to the FGC managers in situations when the child / young person are deemed to be at immediate risk. Referrals will be considered and allocated within 24 working hours of receipt by the Principal FGC Co-ordinator (or delegated officer). The role of the Family Group Conference Practitioner is vital in negotiating attendance at an FGC and in informing all participants about the process involved. This role is separate from other professionals' involvement with the family. The FGC Practitioner will aim to undertake meetings with the nuclear family; this will identify the support networks within the family. It is the aim of the Lincolnshire FGC team that all extended members will be contacted, if a considerable geographical distance is involved this will be primarily by phone however face to face contact may be agreed following a discussion with FGC managers. It is key that within each FGC, the child's voice is captured and where appropriate they attend the conference. The Practitioner organises the meeting in conjunction with the child/young person, parents / carers or friends. Prior to the conference the FGC Practitioner should discuss with the child/young person how they will be enabled to participate in the conference and whether they would like a supporter or advocate in the meeting. The child / young person must be enabled to participate fully within the process and it is the Practitioner's role to find flexible and imaginative ways of achieving this. There will be occasions where the young person chooses not to attend their FGC, should this be the case their input must be sourced in alternative ways. For families where English is not their first language, interpreters will be sourced. The Practitioner negotiates the date, time and venue for the conference with the family and arrangements are made where possible to facilitate their attendance without them needing to take time off work etc. This may mean that conferences take place at weekends or in the evening. The Practitioner sends out invitations and makes the necessary practical arrangements. For families where English is not their first language interpreters will be sourced. The FGC team sits within the wider service area which includes Supervised Contact and PPDU teams. Where one team requires additional support to ensure quality service provision the collective staff group will be asked to cover each other's duties. How does a Family Group Conference Plan integrate with the child's current Social Care Plan? The Practitioner informs the referrer of the date and time of the FGC and confirms their attendance at the meeting. If the referrer cannot attend the meeting they are to nominate another worker from their team to attend on their behalf to share the concerns and strengths with the family group, and then allow the family to agree a plan that will safeguard against the concerns. The Family Plan drawn up at the FGC must be endorsed by the referrer at the end of the FGC. The Plan can then be included in future reviews of the Child Protection Plan / Child in Need plan/Looked After Reviews. Family members who have agreed to monitor the family plan should be invited to future Child Protection Plan / Child and Family Progress Plan / Looked After Reviews to ensure that there is continuity between the processes. 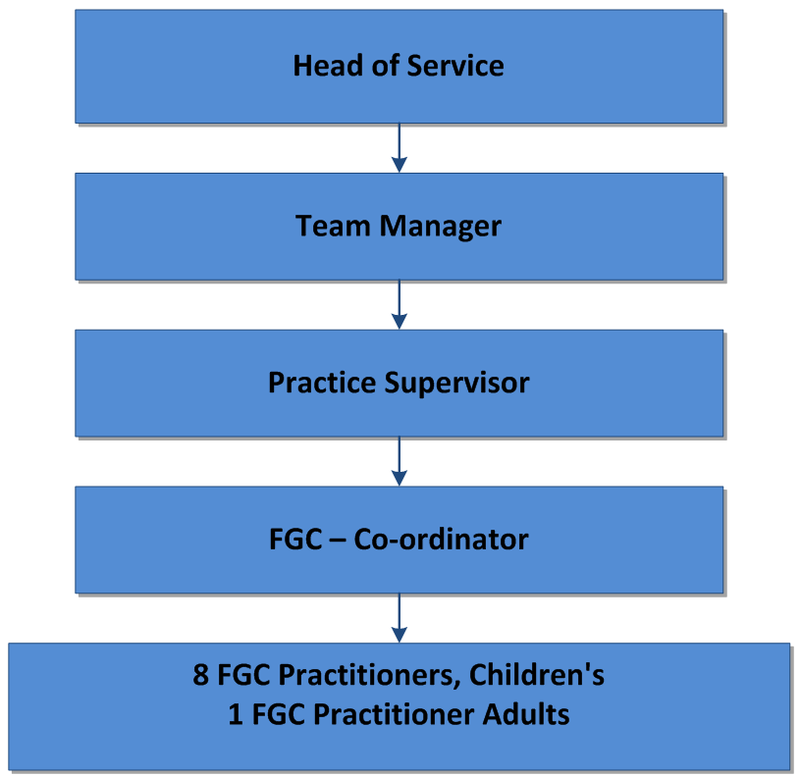 Where the FGC process uncovers new information that the child is suffering or likely to suffer Significant Harm the Practitioner must inform the child's social worker immediately or in their absence refer to that team's duty officer. At weekends and evenings any concerns should be reported to the Emergency Duty Team. If when working a TAC case and new information is uncovered which denotes the child / young person is at risk, the matter must be referred into the Customer Service Centre. Upon completion of the FGC Plan, this will be sent by email to the Principal FGC Co-ordinator (or an alternative FGC manager) for quality assurance purposes prior to distribution. To ensure consistency and professionalism all Plans will be produced in a singular format, this being Arial, size 12. The plan will support Signs of Safety. Upon approval the FGC plan will then be sent to the involved family members and the referrer by post. Pre-paid envelopes are now embedded across the service sites. The FGC services involvement will end once the FGC plan has been completed and a FGC Closure Quality Audit has taken place. The family refuses to engage with the FGC Practitioner. N.B. all of the above points must be discussed and agreed by FGC management. Where the Principal FGC Co-ordinator is unavailable due to training, sickness or leave, senior management will oversee the day to day management aspects. Where it is anticipated that the Principal FGC Co-ordinator will be away from their duties for more than one working day, the senior managers will delegate key responsibilities across the FGC/Contact and PPDU team, this will include attendance at a variety of meetings including Social Care Panel, receiving and allocating referrals and undertaking tasks as required. In the absence of peers, FGC Practitioner's will be expected to cover the key responsibilities / commitments of their colleagues.